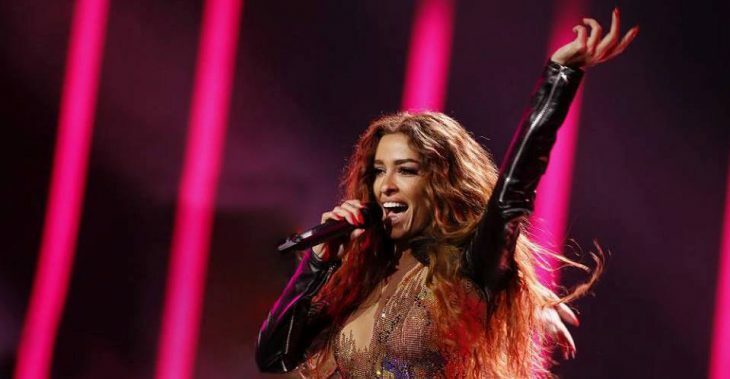 EUROVISION QUEEN Eleni Foureira is coming to LONDON for a one night only, exclusive performance. On Friday 29th June Marquee Events International proudly present ELENI FOUREIRA live at Club Koko in Camden with full band and dancers. On the night there will be various supporting acts including special guest Mixalis Theodosiou with his brand new single. Doors open at 6:30 pm with first support act live at 7:30 pm. Standard tickets are just £40 per person. Book yours now via ticketweb.uk. Standard and VIP tickets are also available via Flames restaurant in North Finchley. This event is over 14’s. Everyone under the age of 16 must be accompanied by an adult. This event is sponsored by London Greek Radio and Flames Restaurant. Our DJs Makis & Avgoustinos will be on the decks, kicking off summer 2018 the Greek way. Doors open at 9pm and the party will continue through till 2.30am. ♫ ♪ They will be mixing Greek & English hits, all night long. Fusing all the best Modern Laika, Greek Club, Greek Classics and Zeimbekika with all the biggest English hits of the decade. ♫ ♪ Please note our online tickets shop is now closed. Limited tickets will be available on the door, please arrive early if you have not pre-purchased your tickets. The Brunswick Centre in Bloomsbury is “going Greek” on Thursday 21st June, from 6 pm to 10 pm for a totally Greek-style event completely FREE! 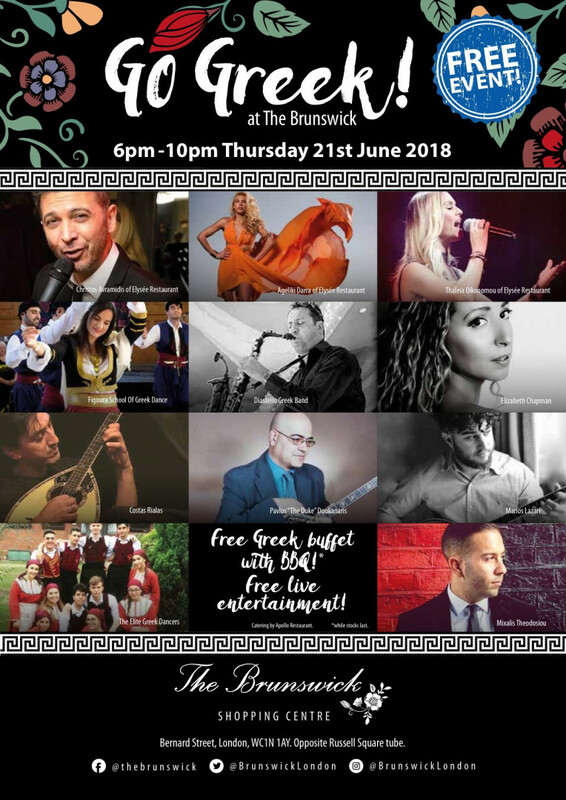 Along with an appetising Greek barbecue for you to enjoy FREE of charge, there will also be the opportunity to sample the traditional Greek sweet ‘Loukoumades‘ and wash it all down with FREE drinks, while you admire a spot of plate smashing and a fabulous line-up of traditional entertainment! Traditional Greek dance performances by Figoura School of Dance and The Elite Greek Dancers; performances will include the Datcha dance, the Syrtos dance with breaking of the kouza, Zorba’s hasapiko / serviko – where audience participation is invited for the finale, the spectacular glasses on the head dance, the Zeimbekiko dance with plate smashing, the table balanced in the mouth dance and the belly dance ‘Horon Tis Jilias’ which again, you are invited to join in. The event will be brought to life with music from Diastello – a fantastic 6 piece band playing instruments such as Bouzouki, Violin, Pithkiavlin and Saxophone. Plus… The amazing Ageliki Darra, Christos Avramidis and Thaleia Oikonomou, all of Elysée Restaurant, will be belting out their vocals on the night. Singers Mixalis Theodosiou and Elizabeth Chapman will be showcasing their latest singles. Bouzouki players Pavlos “The Duke” Doukanaris and Marios Lazari performing select bouzouki solos backed by Diastello, while the legendary Costas Rialias will perform two pieces with Themis. Tickets not required. All you need to do is just pop along to The Brunswick in the heart of Bloomsbury. You will find The Brunswick just over the road from Russell Square tube station, between Marchmont Street, Bernard Street and Brunswick Square and only a short walk away from the British Museum. Nearest tube stations are Kings Cross, Russell Square and Euston. With catering by Apollo Restaurant. Go Greek – a FREE event, whilst stocks last! From 6 pm until 10 pm on Thursday 21st June. London Greek Radio is proud to support the #GoGreek event. Hear the songs of the LEGENDS Grigoris Bithikotsis, Giannis Parios and Stratos Dionysiou sung by their own sons at this exclusive event produced by Privé Productions! Enjoy an evening with the songs and music that form the pillars of Greek music and entertainment today. Join us to sing, dance, drink and celebrate the epic all-time classics that have been sung by these three legends, brought to you by their own flesh and blood – its the next best thing to seeing the legends live – which alas can now never happen. London Greek Radio is pleased to announce that we will be joining thousands at this year’s Cypriot Wine Festival and Business Expo on Sunday 27th and Bank Holiday Monday 28th May. The Cypriot extravaganza is estimated to have over 12,000 people attending over the two days. Parikiaki Newspaper hosts its second year at Lee Valley Athletics Centre, a modern spacious venue where companies, organisations, Cypriot produce and Cypriot wine will be exhibiting for the event’s 36th annual outing. The excitement is steadily building, with hashtag #CyWineFest and #CyWineFest2018 trending as the event attracts all ages and backgrounds. This year’s headlining act is sensational singer Konstantinos Argiros in his live London debut, hitting the stage in the evening. Supporting him is one of our own, British Cypriot singer Kyriacos Georgiou, recording artist and live performer in Greece and other countries. 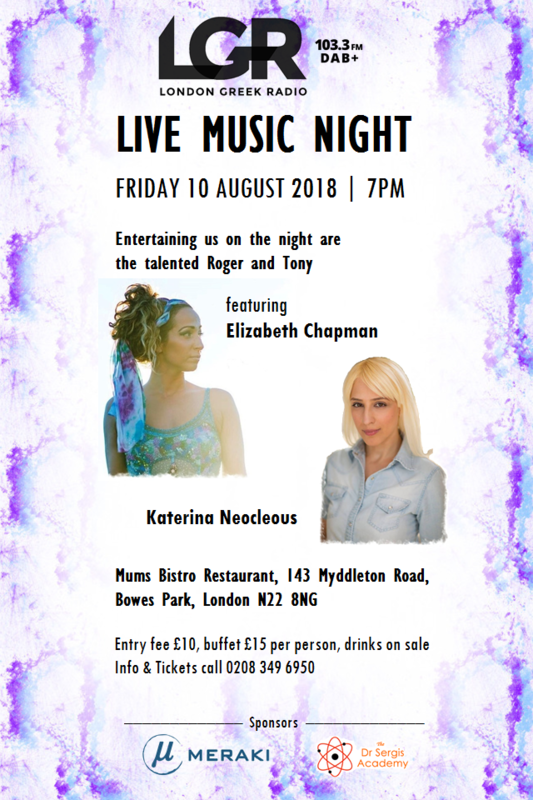 Adding to the dynamic schedule are talented acts, Elizabeth Chapman, performing her latest offering, ‘Irthes Esi’, along with Tony Panayi and George Nicolaou. LGR will be present on both days at our exhibition stand where you can find us, facing the stage, near the entrance. Come and meet your favourite radio personalities, take part in our prize draws, and we’ll also have some giveaways! We are looking forward to seeing you there. Come and say hello! Doors open at the slightly later time of midday and close at 11.00 pm on Sunday 27th and 11:30 am to 10.00 pm on Bank Holiday Monday 28th May 2018. LGR presents popular singing sensation, Plastikes Karekles on Tuesday, 22nd May, at The Village Greek Restaurant in New Barnet from 7 pm. Join us to enjoy some amazing Greek music & for a night to remember! Plastikes Karekles at The Village Greek Restaurant, 24 Lytton Road, New Barnet, EN5 5BY. For more information & for tickets, call LGR on 0208 349 6950. London Greek Radio are proud to co-sponsor Dionisis Sxoinas with the Hilton Park Lane for a one-night-only concert on Saturday 19th May 2018 brought to you by Hellenic Nights London. The Greek singer’s debut London performance will be with his backing group from Athens and the party won’t stop until 5 am! Hellenic Nights have collaborated with Show Time Productions to bring a line-up comprising of Kostas Lianas, Dimitris Tiktopoulos and Eirini Zei. A special guest set by DJ Valentino is expected to fire-up the atmosphere for what is said to be one of the biggest live clubbing events in London this year. Following the huge success of Hellenic Night’s last event with Vasilis Karras and Christos Menidiatis, LGR is excited to join them at the Grand Ball Room of the Hilton Park Lane in Mayfair for this night. Dionisis started his music career in the 1990s and two decades later, remains as popular as ever. He attracts big crowds in Greece and with a back-catalogue of greatest hits, he’s sure to impress our London crowd. The event is sponsored by London Greek Radio (LGR) and Hilton Park Lane Hotel.